Here at Goodman Plumbers, we realize that a clogged drain can be a huge inconvenience for you and your household. Clogged drains prevent water from draining properly, and can cause excess amounts of stagnant water to remain in your plumbing fixtures. Many people attempt to remedy this problem with over-the-counter drain cleaners, only to find that they do not possess the power needed to unclog the drain. Before you attempt to do this, contact Goodman Plumbers, and let a trained plumber provide you with a long-term, comprehensive solution to your clogged drains. Ordinary household refuse such as grease, hair and hard residue can easily spell disaster for your plumbing system. These same materials are responsible for an overwhelming majority of drain clogs, and over-the-counter cleaners may not be able to clear them adequately. Our company utilizes modern, high-powered drain cleaning methods to completely remove all debris from your drains. We can clean the following types of drains. Our unique hydro-jetting process can easily unclog any drain and restore your plumbing system back to its normal level of functioning in record time. Another common cause of drain blockages is hard deposits. These deposits build up in your pipes over time and are almost always resistant to over-the-counter drain cleaners. If your pipes currently contain deposits, even after they are cleared, there is a strong possibility that they will return. Hydro-jetting is one of the industry’s most trusted methods of clearing hard deposits. Water jetting systems deliver large amounts of highly-pressurized water directly into your drains and pipes, instantly clearing away any deposits or debris. If your pipes are currently clogged, a plumber from our company will be more than happy to show you the strength and efficiency of hydro-jetting in person. Goodman Plumbers is proud to offer our exceptional drain cleaning services to all home and business owners. If you suspect a problem, but you aren’t ready to commit to a plumbing service just yet, our business can provide you with a free estimate in a relatively short period of time. We currently have an “A” rating on Angie’s List and a five-star rating on Yelp. 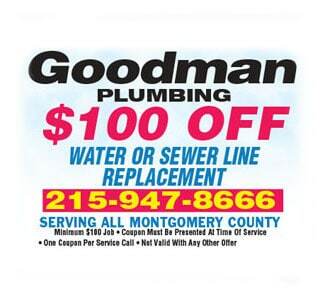 We have also received the title of “Best Emergency Plumber” from Best of Philly Magazine. Call us today at 215-364-7775 to schedule your drain cleaning right now! 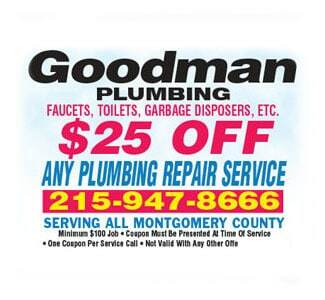 Goodman Plumbing is a second generation company that has over 6 decades of experience and outstanding growth. 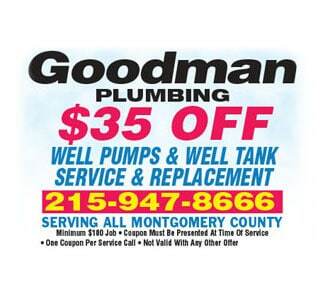 Recognized as one of the best plumbing companies in the Delaware Valley, Goodman Plumbing’s achievements are the result of our family values that are part of every project no matter how large or small. This is why it is extremely important to us that we treat our customers like family. So if you need drain cleaning, toilet repair, well service or even water damage restoration contact us today and schedule your next appointment! Serving Abington, Willow Grove, Horsham, Fort Washington, Feasterville Trevose, Langhorne, Yardley, Newtown, Richboro, Warrington, Doylestown, New Hope, Chalfont, Lansdale, King of Prussia, Wayne, Havertown, Springfield and surrounding!